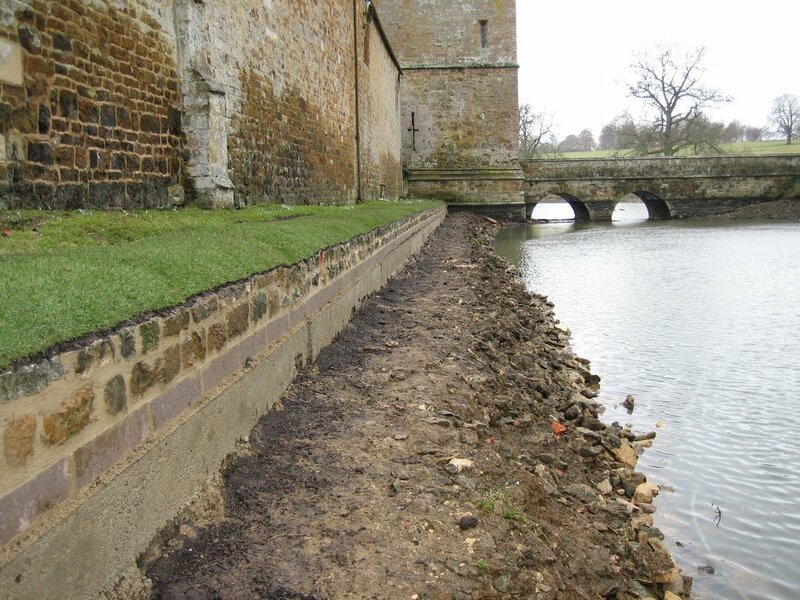 This winter’s repair and maintenance work has involved emptying the moat to about a quarter of its normal volume, and tackling the deteriorating inner bank on the north side of the moat either side of the Gatehouse. Time, the ducks and the beastly Canada geese are probably responsible for the gradual erosion of these banks. Perhaps even the many grass snakes living on various patches around the moat have also contributed. Not a lot of people know that grasss snakes love swimming – hence their latin name natrix natrix. It is only mildly alarming when swimming you see their little heads above the water as they wiggle their way from one bank to another. Enough digression – here are the banks – newly rebuilt with a concrete base and, for aesthetic reasons, stone on the top which will end up being visible above the water level. Cost prohibited doing the whole thing in stone. 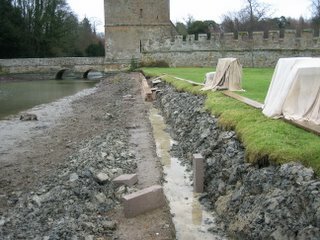 This side is still being finished, but you can see that here we are having to fill in between the eroded bank and what we assume was the original shore line. The filler here is the blue clay originally used to line the base of the moat when it was constructed in the early 15th century. This entry was posted on Monday, February 13th, 2006 at 4:53 pm and is filed under Broughton Castle.